As we transition into fall (Ha! Fall? What’s that? ), I find myself wanting to reach for darker lip colors and bolder nail polishes. However, there is one exception: rose gold. Here are my favorite rose gold makeup picks that I seriously can’t get enough of year round. I am not responsible for your sudden urges to run to your nearest makeup retailer and purchase everything. When Urban Decay released their Naked 3 Palette, there was a huge craze over it. I bought it the day it released. While I won’t say that it’s my most used palette, I do think there are some fantastic shades in this palette. I do have to use other palettes with it to create a complete look, but there really are some standout shades. I find myself reaching for it a little more lately. I picked this blush up recently and I am in love. Milani blushes are amazing quality (Luminoso is one of my favorite blushes ever!) and this is no exception. It’s highly pigmented, blends like a dream, and looks amazing on the skin. It’s pretty shimmery, although not chunky glitter-y. Definitely no need for a highlighter with this one. I honestly feel like I love this palette more than the Naked 3. I feel like it has more of an overall rose gold theme than the Naked 3, and I don’t usually have to use another palette to create a complete look with it. The quality of the shadows are amazing, just like my other Lorac palettes. It’s just beautiful. This product is a limited edition product that was released this spring, but if you can get your hands on it, grab it. You can get it from the MAC website using that link above! It’s a beautiful rosy powder that I use mostly as a highlighter or to layer over blush. It has a light rosy highlight and looks great by itself on the cheeks or layered over a neutral blush. This nail polish is one of my top favorite nail polishes of all time. It’s so metallic and striking on the nails and I always get compliments when I wear it. It’s one of those polishes that you can wear any day of the year and it works. It goes with everything, and every season. There you have it! 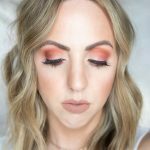 My favorite rose gold makeup! What are you loving lately? Totes just ordered that Lorac pallet. All of these colors are gorgeous!! I really feel like I need to completely overhaul my make up… I love the palettes!! I still haven’t gotten my hands on Naked 3 — I own all the other naked palettes, but I just can’t decide whether or not to get it! I’ll have to check out that polish. Fun! I love rose gold too, it’s so easy to wear for day or night. Love the UDN3!